Buying a home will probably be the most expensive purchase anyone makes in their lifetime. There sure are a lot of moving parts to consider. Buyers want to make sure that they get a good price on the dwelling. Plus there is the matter of applying for the loan. That is a separate transaction in itself. Not to be lost in the shuffle is the home inspection. This is probably the last item on a buyers mind. But the home inspection is truly an important piece in the overall home buying process. 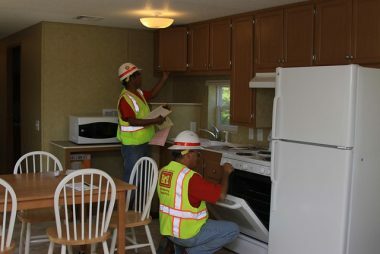 A home inspection is conducted to protect the buyer. Its main purpose is to check the overall quality of the home and then to relay that information back to the buyer. A home inspection can bring to light issues that may actually cancel the sale, or at least be remedied before the closing. So let’s take a look at what is involved in a home inspection, what it costs, commons issues that are uncovered, and what you should know about the report that is issued. Home inspections are conducted by a qualified home inspector. However, they aren’t mandatory; but are highly recommended by any professional you talk with. It is also a contingency in many contracts. There aren’t many reasons to skip the inspection. Many real estate professionals will tell you that many buyers end up regretting it. The only reason that one might want to skip the process is if there is more than one offer on the home. The seller might choose the buyer who opts out of the check on the home. Before you choose to opt out of an inspection, you should know that the costs are really inexpensive when you consider the overall home buying experience. An inspection should cost in the neighborhood of $200-$600. It all depends on the inspector you use, the size of the home, the age, and even the location of the home itself. Older homes cost more because they normally have more wear and tear. If electrical systems have been replaced or the home has been remodeled, this may require more inspection time. He or she should be able to offer an estimate before they begin their work. The cost you will pay will vary as discussed above. We will break it down even further. Remember that the smaller the residence, the less you should have to pay. There isn’t going to be a set standard. Be sure and ask your inspector the cost before you agree. These types of residences have lower costs. Inspections on condos that have square footage under 1000 total square feet, should cost a buyer somewhere in the neighborhood of $200. Townhomes will come in 2 different variations. Attached and de-tached townhomes. The latter should be grouped with single family home costs as they are independent structures. The attached variety will share a wall with the neighbor and potentially a roof. Remember townhome square footage will vary. They can easily exceed 2500 square feet. Now some inspectors will charge based upon the hour. Here the fees come can back somewhere between $50-$75. Check out this resource for a company that publishes their inspection fees online. Here are some samples. Over 4500 sq. ft. 14 cents per sq. ft. Here is a great resource for certain home repairs and what they might cost. The list can be long or short. But usually glaring weakness can be revealed among older and newer homes. Don’t think just because a home is brand new that is without its faults. The process of constructing a home is a long one, and many errors can be made along the way. Buyers sure would want to know about a rodent or pest issue. In certain parts of the country, termites are also a big problem. In many cases, issues are so severe, that buyers must vacate the home temporarily so the fixes can be put in place. Other pests to be aware of are carpenter ants. If you are using the services of a real estate agent, ask them about pest inspections. You probably hired an agent to assist you through the process. So any questions you have should be directed towards them. If you aren’t using the services of a realtor, then you will need to be proactive. Home maintenance can be quite costly. Don’t you want to know what potential costs you may have to bear in the foreseeable future? Some of the largest replacement costs can be attributable to a new roof. Before you purchase that new home, don’t you think it’s worth it to determine how many more years of roof life you may have left? This won’t be a concern for a newer home, but should be with an older home. This may assist you to start to budget for certain items in the home. The inspection should take several hours to complete according to this guide. Remember the seller isn’t going to point out all the items that need to be repaired or replaced. The only person that will be able to discern what needs to be fixed and replaced will be the buyer. And this can only be accomplished by employing the services of a home inspector. After the inspection report has been delivered, the buyer has a few different options. Proceed, ask for certain repairs, or back out of the purchase entirely. Remember that if you choose to forgo the inspection process, you won’t have this option. This is probably one of the most important reasons to go ahead with that home inspection. At this time the buyer can request that certain repairs be made. The homeowner may choose not to. But they can offer to lower their selling price as a means of negotiation. If a buyer has gone this far in the process, chances are they won’t be scared off, but they probably won’t roll over and accept the house as-is. Further negotiations may be needed. As a potential individual in the market can see, a home inspection really is vital. Without one, it maybe be compared to potentially shooting yourself in the foot. It’s possible too that a home inspector may actually miss something important. That’s why when you consider hiring an inspector, you interview 2 or 3, and have a list of thorough questions that you want to be answered. Here are some questions that you might want to consider. What if you miss something during the inspection process? Can you provide 2 references we can contact? Can you offer an inspection report of a previous home so I can review? How long does the inspection take and more importantly, what are your fees? I completely agree with the points mentioned in the article. The home inspection is very important because of various reasons. I recently buyed a property and did pest control by hiring Rodent Control CT. Now my home is free of pest and rodent. It is always good to do a home inspection before buying the property.